Welcome to our webpage just for YOU! 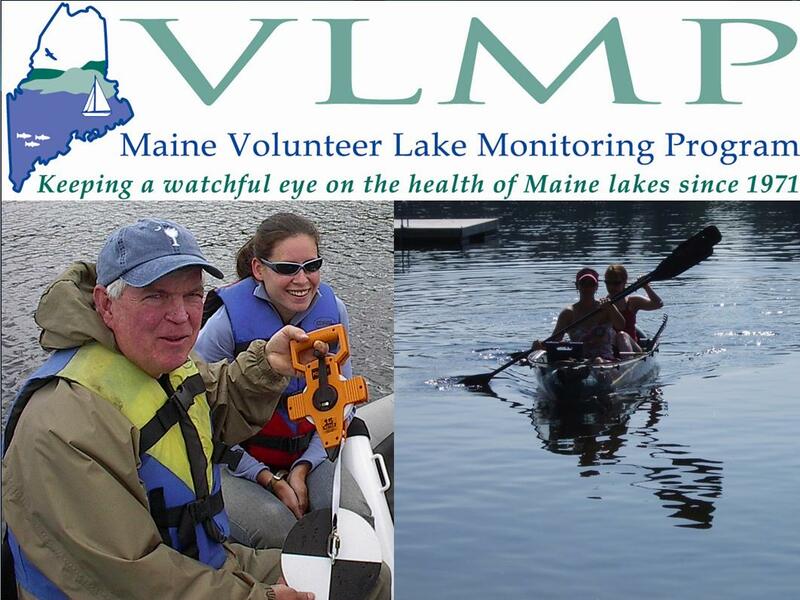 When the Lake Stewards of Maine (LSM) achieves its ultimate goal as an organization, virtually every lake in the State of Maine will have one or more water quality monitors and an active team of trained Invasive Plant Patrollers routinely monitoring the health of the waterbody. 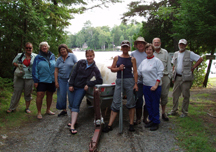 This statewide cadre of dedicated volunteers, trained and certified by the LSM, will be supported and sustained by a well-organized, integrated, collaborative system involving the LSM, local, county and State agencies, trained volunteer coordinators, local lake associations, and regional lake conservation groups. Such a structure provides opportunities for volunteer leadership at every level: trained Invasive Plant Patrollers, IPP Lake Team Leaders and IPP Regional Coordinators. The benefits of such a system include: technical assistance and quality assurance checks at each level; enhanced volunteer involvement and contribution; improved program efficiency and sustainability. This webpage was designed to provide resources, technical support and sharing opportunities for all who are working to support Invasive Plant Patrol programs in Maine. 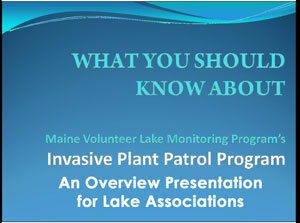 A presentation by LSM’s Roberta Hill for use by Maine’s lake and watershed associations to spread awareness of invasive aquatic plants and volunteer opportunities to join in the effort to protect our lakes and ponds. These files may take a few minutes to load. Be sure to save the file after viewing. This presentation describes LSM’s plan for growing and sustaining Maine’s Invasive Plant Patrol, and how you and your community can play a key role. Over the years it has been in existence, the LSM Invasive Plant Patrol program has grown by leaps and bounds. With hundreds of new Invasive Plant Patrollers being added to the program every year, the IPP program depends upon volunteers LIKE YOU who will play leadership roles at every level. The purpose of the IPP Leaders’ Handbook is to help you find your particular leadership role in this emerging system, and to provide you with some initial guidance as you begin the process of establishing a sustainable early detection program in your community. Maine’s early detection system is alive and well, and growing steadily every year. The LSM has now trained thousands of invasive plant patrollers statewide. This active growth in the program bodes extremely well for the future of Maine’s lakes, ponds and streams. This would not be possible without the collaboration and support of people like you who are willing to help us coordinate workshops at the local level. 2) Publicizing the workshop to help generate local interest (ideally, in collaboration with nearby co-hosts). We also ask that all host groups consider collectively making a nominal donation to help support IPP workshops statewide. The suggested combined donation per workshop (or workshop series if you are co-hosting two workshops in your region) is $400. This document explains everything you need to know about planning and coordinating your workshop. This information will help you complete your Host Questionnaire. One of the primary roles of the IPP host/s is to help spread the word about workshops. Below are some documents and templates to help you with public relations. The templates are in MS Word format so you may adapt them to your needs. Does Your Lake Have an Invasive Plant Patrol Team? When it comes to monitoring aquatic invaders, the more eyes on the water, the better. The creation of strong, active Invasive Plant Patrol Lake Teams is seen as essential, not only to ensuring the quality of invasive aquatic plant surveys, but also to the long term sustainability of Maine’s early detection effort. As part of a larger team, each patroller can focus more comprehensively on a smaller survey area. The ideal survey sector is one that can be easily handled by the assigned team member. An active, well trained, fully equipped survey team benefits your lake community in many ways. 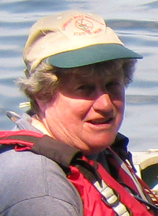 The team can rule out presence of invasive aquatic plants annually, help educate and engage the lake community (friendly face-to-face encounters, dockside, are commonplace during plant surveys) and provide a better understanding of your lake’s unique native plant communities. Over seventy Maine waterbodies are now being monitored by active or actively forming Invasive Plant Patrol lake teams and several successful Regional IPP Teams (An IPP Team is defined as “four or more trained Invasive Plant Patrollers working in concert to conduct one or more invasive aquatic plant screening surveys.”). Maine’s largest IPP Team, on Damariscotta Lake, has had as many as 160 trained patrollers participating in a single season. Whatever the size and scope of your team, working as part of a team is safer, more effective, more efficient, more engaging, and more fun! One great way to begin building you team is to host an Invasive Plant Patrol workshop in your area. If you are interested in hosting (or co-hosting) an IPP workshop please contact the LSM at 207-783-7733 or stewards@lakestewardsme.org. This map shows the number of active or actively forming Invasive Plant Patrol (IPP) Teams in each of Maine’s sixteen counties. An IPP Team is defined as “four or more trained Invasive Plant Patrollers working in concert to conduct one or more invasive aquatic plant screening surveys.” For the current listing of teams by county, please see the IPP Leaders Directory, below. The purpose of the Team Roster Template is to help Invasive Plant Patrol team leaders keep track, on an annual basis, of the training and survey activity of individual team members. This worksheet may be adapted as needed. Please complete and include the Regional IPP Survey Summary Sheet with copies of all IAP Screening Survey Documentation Forms, bundled by waterbody, for your region. This form is intended to help you track the survey activity of the IPP lake teams in your region, and provide a useful summary of this activity for others. 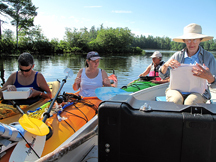 Maps are an essential part of an effective Invasive Aquatic Plant Survey, and are used for a variety of purposes. Click here for mapping resources. Click here to enter Maine’s Interactive Field Guide to Aquatic Invaders and Their Native Look Alikes – An online resource for Maine’s common native and invasive aquatic plants & animals. For more Plant Identification Aids, visit the Invasive Aquatic Species Resources page. Let us help you! Click here to learn how to submit your suspicious plant specimens to the LSM for identification. To sign up for these workshops, visit our Volunteer Leadership Training Opportunities page. The IPP Leaders’ Roundtable, held in mid-March in Auburn, allows Lake Team Leaders, IPP Regional Coordinators, trained Plant Patrollers and other interested persons to join together to exchange strategies and ideas aimed at building and growing volunteer early detection networks. This workshop provides IPP Leaders with the guidance and materials needed to organize and lead an exciting community outreach event. “Plant Paddles” are short (2 – 3 hour) guided explorations that take place on shore and on the water. 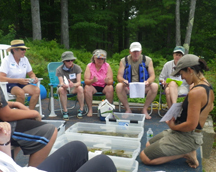 They provide a fun, informal way to introduce community members to the threat of invasive aquatic plants and the importance of early detection. Plant Paddles may be organized as a stand-alone outing, or as part of larger community events such as lake days, civic group meetings, school outings, lake association meetings, etc. 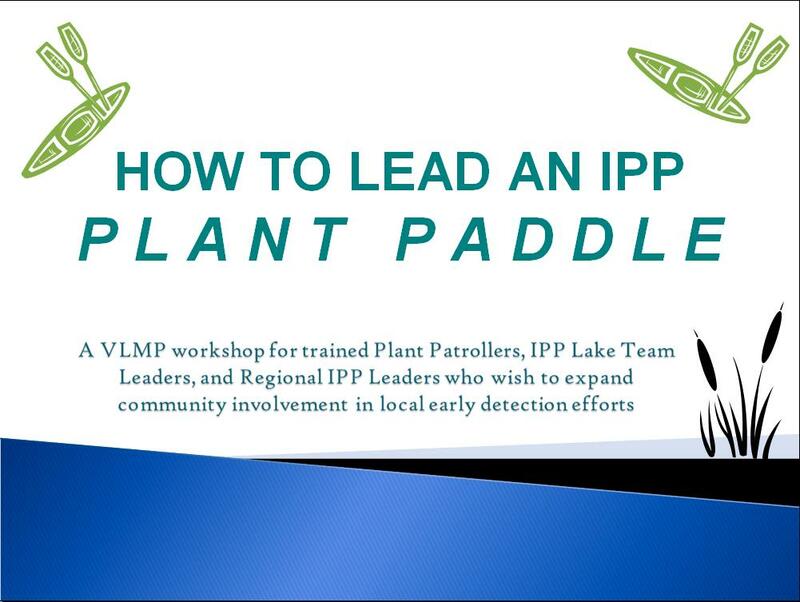 This training presentation provides an general overview of the IPP Plant Paddle and specific recommendations for planning and leading your own community event. File size is 2.34MB and may take a moment to load. The LSM offers a wide variety of training opportunities for those who would like to become more involved in Maine’s statewide early detection effort. Since the first IPP workshop in 2002, the LSM has trained thousands of individuals to screen Maine waters for aquatic invaders. IPP trainings have been specifically designed to engage widespread participation. Do you simply want to be more knowledgeable when you are out recreating on your lake, or do you wish to conduct and lead a comprehensive lake-wide survey? All are welcome! 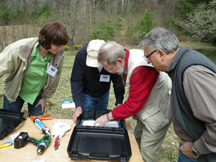 IPP First Responders are trained IPP volunteers who are willing to be on-call should a new infestation be identified anywhere in the State of Maine (limits on distances one is willing to travel may be specified, of course). This mobile, ready-to-go team is able to move confidently and swiftly when the need arises. With the LSM coordinating with the local lake community, trained Plant Patrollers may be paired up with members of the local community who may have great familiarity with the lake of concern, but limited knowledge of invasive plants, thus enhancing not only the quality of the survey, but the quality of the survey experience for everyone involved. The First Responder concept was successfully tested on Damariscotta Lake in 2009 when twenty-seven trained invasive plant patrollers (many traveling from distant corners of the state) participated in the intense search that followed the discovery of hydrilla in a small cove along the western shore of Damariscotta Lake. To date, no additional hydrilla has been detected in the lake. IPP Jump-Start was initiated to conserve native ecosystems now threatened by a wide array of invasive aquatic organisms, by “jump-starting” locally-sustainable, citizen-based invasive aquatic species monitoring in areas of the state where such activities are currently lacking. At the core of this program is the IPP Jump Start team: comprised of trained IPP volunteers, state agency personnel, LSM staff and other professionals working alongside of –and mentoring– novice plant patrollers and other members of the target community. Engaging and leading by example, the IPP Jump-Start team conducts an invasive aquatic plant screening survey and baseline native aquatic plant inventory on the waters of the target region while providing one-on-one outreach to the community. IPP Jump-Start got its start in the Moosehead Lake Region in 2008. Click here to go to newsletter article. An online meeting place for Invasive Plant Patrollers playing key leadership roles in their communities. Leaders, this is your space to post announcements, share stories, and participate in a vibrant marketplace of ideas. Trained volunteers are the head, heart, and soul of the LSM. LSM volunteers bring special skills, unique insights, creative ideas, and an innovative spirit to their work. 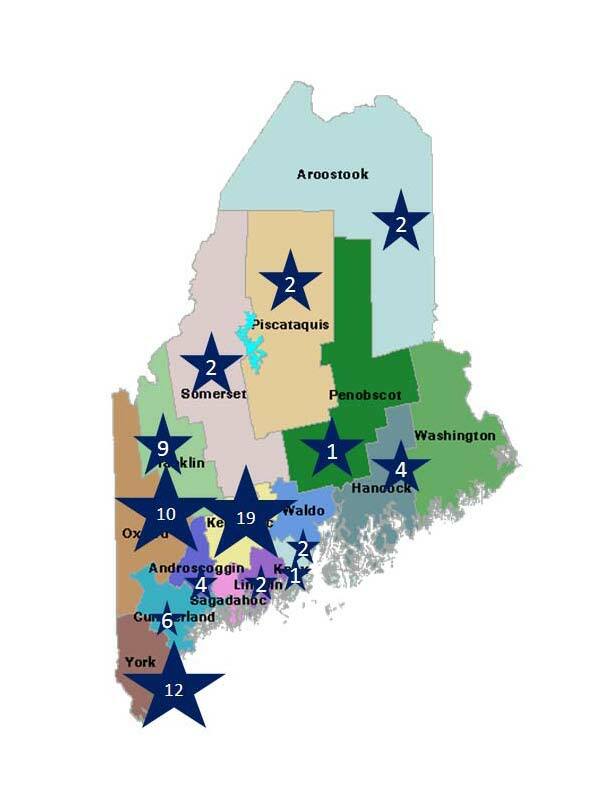 The purpose of these directories is to facilitate communication between leaders of local IPP programs across the state of Maine, in order to ensure that this wealth of information and experience is shared as widely as possible. IPP teams in close proximity to one another may wish to collaborate on regional trainings, surveys, scope clinics, recognition events, etc. Newly forming teams may wish to reach out to experienced teams for guidance. Experienced teams may enjoy taking a novice team under their wing to help them get off to the best possible start. PLEASE HELP US STAY CURRENT! If your information does not appear in either directory, or if the information provided for your listing is incorrect, please contact the LSM at 207-783-7733 or stewards@lakestewardsme.org. Also, if you would prefer to have your contact information kept private, please contact the LSM.